"Tuesdays at Castle Glower are Princess Celia's favorite days. That's because on Tuesdays the castle adds a new room, a turret, or sometimes even an entire wing to itself. No one ever knows what the castle will do next, and no one - other than Celia, that is - takes time to map out the new additions. But when King and Queen Glower are ambushed and reportedly killed, it's up to Celia with her secret knowledge of the Castle's many twists and turns, to protect their home and save their kingdom." 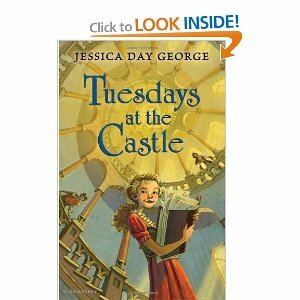 Tuesdays at the Castle is the newest book by author Jessica Day George. This exciting new book, geared toward children, was a wonderful read for me as an adult. The story takes place in a castle that is magical and constantly changing its structure. It lengthens its hallways, adds new rooms and staircases too. It even changes the location of rooms! The characters are the royal children, Rolf, Lilah, and Celie. Celie is the main character and loves the castle! She knows it best and maps it’s changes and where everything is located. This Jessica Day George book is one you don’t want to miss! Join Celie and her siblings on this roller-coaster journey through this amazing castle! You won’t want to miss the laughter, the danger, the tears! Celie will take you on a journey through the castle and show you how she isn’t just your average eleven year old! She and her siblings are put to the test when their parents go missing and those meant to protect and help them are not what they appear to be. I loved this book and I couldn’t put it down! I stayed up reading it and had it finished in less than a day. Jessica weaves a story of magic, wonder, and keeps you guessing until the end! A wonderful addition to her previous successful novels; this is one you don’t want to miss! Bravo Jessica, please write many more! I purchased this book and did not receive any compensation for this review. "Lola Moori is hiding a secret she doesn't know she's keeping. She begins to remember someone. Someone important. His name is Gabe…and whatever they shared, she could feel that it was epic. Yet it seems Gabe wanted her to forget him. Forever. The curse that repressed Lola’s memories for the span of several lifetimes is coming undone. But unfortunately, she discovers that some secrets are better left buried." I had no preconceived ideas of this book. I downloaded it onto my kindle and started to read. I LOVED this book! Meet Lola, a gypsy who wants to escape her father, Christo, but can not accomplish that unless he is put in prison. She decides she has to do this and escapes from him and heads to Florida to live with her Grandma Miriam. Lola meets two cousins she didn't know she had and the very interesting Constantin family that lives next door. I borrowed this book from the kindle library and loved it so much that I purchased it! I received no compensation for this review. 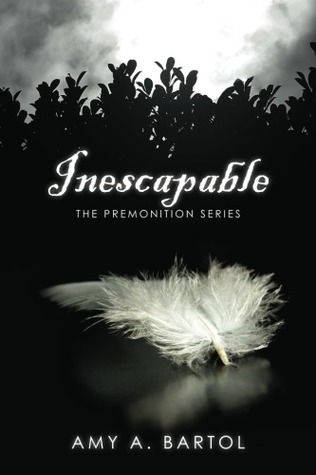 "My name is Evie Claremont and this was to be the making of me–my freshman year of college. I’d been hoping that once I’d arrived on Crestwood’s campus, the nightmare that I’ve been having would go away. It hasn’t. What is the secret that he’s keeping from me? I’m hoping that it’s anything but what I suspect: that he’s not exactly normal…and neither am I. So, maybe Crestwood won’t be the making of me, but it could be the breaking of me. I’ve been left to wonder if the dark future my dream is foretelling is…inescapable"
The characters are so intriguing and trying to figure out the secrets is so hard! The twists and turns I didn't see coming! It was so nice to not be able to tell what was going to happen and to be surprised, for once! I don't want to spoil it, I hate it when reviews do that, so I won't. But this book is so worth your time! I love it! It does contain some cussing in it, though that was minimal and I was able to skip over it, without it interfering with the enjoyment of the book. It is a clean read as well with no inappropriate scenes in it. Five stars to Amy A. Bartol, my favorite book so far this year!!! I purchased this book and received no compensation for this review.